Fiber rope is a commonly used tool which has many applications in daily hoisting and rigging operations. The fibers in these ropes are either natural or synthetic. Natural fiber ropes should be used cautiously for rigging since their strength is more variable than that of synthetic fiber ropes and they are much more subject to deterioration from rot, mildew, and chemicals. Check first for external wear and cuts, variations in the size and shape of strands, discoloration, and the elasticity or “life” remaining in the rope. Untwist the strands without kinking or distorting them. The inside of the rope should be as bright and clean as when it was new. Check for broken yarns, excessively loose strands and yarns, or an accumulation of powdery dust, which indicates excessive internal wear between strands as the rope is flexed back and forth in use. Check for distortion in hardware. If thimbles are loose in the eyes, size the eye to tighten the thimble (Figure 2.1). Ensure that all splices are in good condition and all tucks are done up (Figure 2.2). 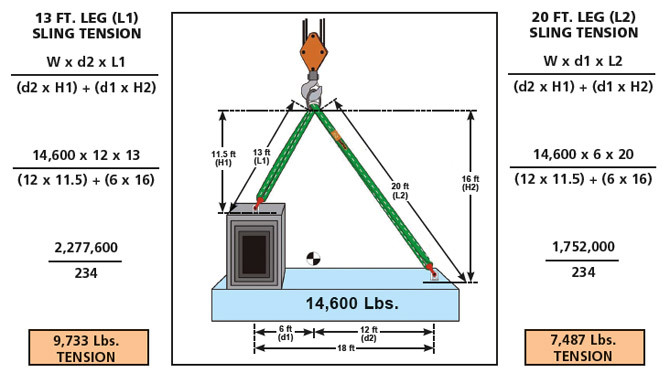 In this example, the chain or gin wheel has a stamped capacity of 1000 pounds, but, in compliance with the Construction Regulation, it can safely lift a maximum capacity of 600 pounds. Select the size and type of rope to use based on manufacturer’s information; conditions of use; and the degree of risk to life, limb, and property. The WLL of fiber rope is determined by multiplying the working load (WL) by the SF. The minimum breaking strength (MBS) is the force at which a new rope will break. • Never drag a rope along the ground. Abrasive action will wear, cut, and fill the outside surfaces with grit. • Make sure that fiber rope used with tackle is the right size for the sheaves. Sheaves should have diameters at least six – preferably ten – times greater than the rope diameter. Wherever practical, avoid tying knots in rope. Knots, bends, and hitches reduce rope strength considerably. Just how much depends on the knot and how it is applied. Use a spliced end with a hook or other standard rigging hardware such as slings and shackles to attach ropes to loads. 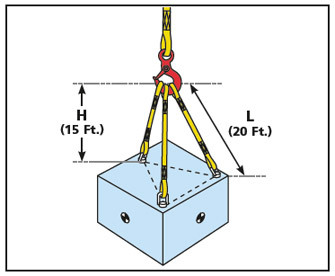 In some cases, however, knots are more practical and efficient than other rigging methods, as for lifting and lowering tools or light material. Following the right sequence is essential in tying knots. Equally important is the direction the end is to take and whether it goes over, under, or around other parts of the rope. WARNING – When tying knots, always follow the directions over and under precisely. If one part of the rope must go under another, do it that way. Otherwise an entirely different knot – or no knot at all – will result. Once knots are tied, they should be drawn up slowly and carefully to make sure that sections tighten evenly and stay in proper position. Never jams or slips when properly tied. A universal knot if properly tied and untied. Two interlocking bowlines can be used to join two ropes together. Single bowlines can be used for hoisting or hitching directly around a ring. Can be used for tying two ropes of the same diameter together. It is unsuitable for wet or slippery ropes and should be used with caution since it unties easily when either free end is jerked. Both live and dead ends of the rope must come out of the loops at the same side. It is also larger, stronger, and does not injure the rope fibers. The figure-eight knot is useful in preventing the end of a rope from slipping through a block or an eye.